Record signing Chris Wood wants to make a name for himself at Turf Moor after making a dream start to life in a Burnley shirt. The 25-year-old, who made the move from Elland Road last month, made it two goals in as many appearances for the Clarets when scoring the winner against Crystal Palace at the weekend. The New Zealand international anticipated the back pass from Chung-Yong Lee before firing a first time shot past Wayne Hennessey from 25 yards out. After netting on his first Premier League start for the club, Wood said: “It was fantastic. “Hopefully I can go on and do great things here and be a great name in a Burnley shirt and I’m looking forward to doing that together. “Normally as a striker you have first instincts and your first thought is the right one, and it was. “It’s one off the back, especially at home. “It’s nice that I can tick that off and now I can focus on a lot more things, both for myself and the team. Last season’s leading scorer in the Championship, with 27 goals, may have made the difference at one end. But the striker voiced his admiration for those at the other who soaked up the Eagles’ pressure. 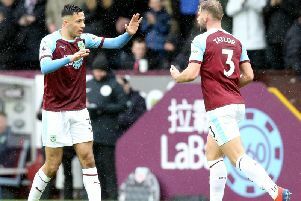 With Burnley digging deep, putting everything on the line to preserve their advantage, Wood said: “The team worked tirelessly and the back four and five, including when Popey came on, were absolutely fantastic. “Everybody worked their socks off and they did very well. “Sometimes you just have to grit your teeth and do it and it was one of those days. “We dug in really well and showed our character and this is what this Burnley team is all about. “It’s not just the strikers, we’ve got some great players in midfield and out wide that can cause major problems. “So if we are keeping clean sheets, then we will have a great chance of winning games. “It is a good start, but that’s all it is.